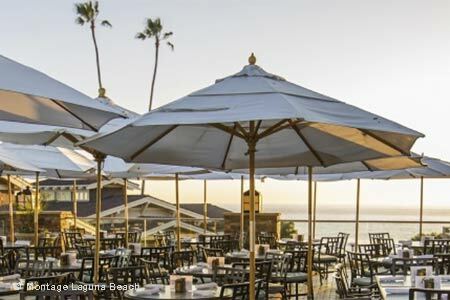 Poolside restaurant with a killer ocean view at the Montage Laguna Beach. : Mosaic Bar & Grille is located on the Montage Laguna Beach property, next to one of the most beautiful pools in California. Plus, this outdoor dining spot has a killer ocean view. Sit under an umbrella, order a drink or glass of wine and nosh on California-inspired fare, including sandwiches, salads and fresh seafood. Signature dishes include the nachos, shrimp ceviche, Cobb salad, and a burger served with thyme fries, sweet potato fries or baby greens. For dessert, you might find a chocolate s’mores sundae or red velvet ice cream sandwich. The restaurant is open daily for lunch year-round, and cabanas are available via reservation for a more intimate lunchtime experience.